Side view of the cup showing profile and handle. Coffee cup, porcelain with black bat print of a maritime scene, with figures on a headland watching ships out to sea. The print, the rim and handle with gold bands. 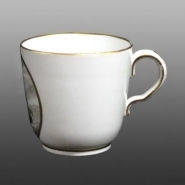 Porcelains cups of this form have been traditionally grouped together as the products of 'factory z'. Research continues to discover definitive evidence of the actual maker believed to be Thomas Wolfe.